The Baden-Württemberg Stiftung is one of the largest operative foundations in Germany, promoting projects in the fields of research, education, society and culture. The 2013 annual report is part of the “Future – Home” concept, which was created to span three years. It focuses on the activities of the foundation as well as on its capacity for innovation and its ability to satisfy future needs. The image section introduces people who are helping to shape the future of the state with projects funded by the foundation. Working closely with these people, photographer Olaf Unverzart embarked on a “tour” of Baden-Württemberg to create a photographic travel diary. The resulting large-scale photo series features plenty of local colour providing rich insights into local projects, while bound-in inserts with compact text, graphics and illustrations establish a clear link to the work and interest of the foundation. Removable postcards with motifs of the visited areas add a tactile dimension to the report. 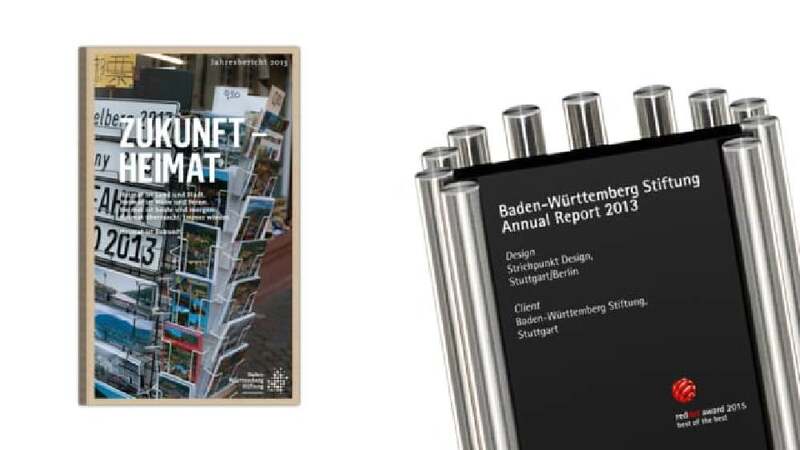 The most outstanding feature of the annual report of the Baden-Württemberg Stiftung is the highly varied and vibrant implementation of content. The theme of “home” is conveyed in a playful manner through the use of different kinds of paper, column widths, foldings, embossings and inserts, as well as an extensive picture series. All those elements contribute to lending the report an additional sensual character that makes reading and leafing through it a pleasure.